Perfectly designed with accented jade wings on top of a black acrylic base. 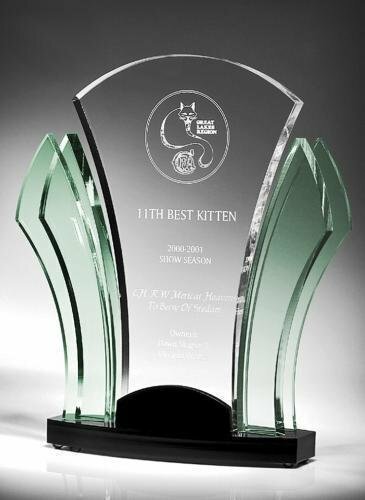 Acrylic thickness is 1/2" thick for the 9" tall award and 3/4" thick for the 11" and 13" tall award. Laser engraving to a frost white text color. 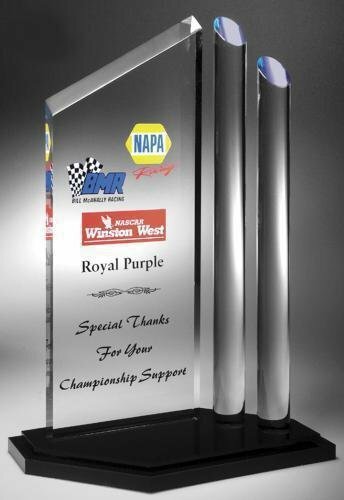 Full Color Imprinting available as an option on this acrylic award. Elegant cuts on this achievement diamond acrylic award creates a stunning elegant look. this acrylic award is 1" thick on a 1 1/2" base. Laser engraving to a frost white color. Full color imprinting option is available on this acrylic award. Available in two sizes. Stunning rich diamond shaped acrylic posts accented with gold, silver, blue, green, red or purple accent color. Laser engraving on a black plate that adheres to the base. Text color choice of either gold or silver. Available in two different sizes. Stunning rich diamond shaped acrylic posts accented with gold, silver, blue, green, red or purple accent color. Laser engraving to a frosted white color. 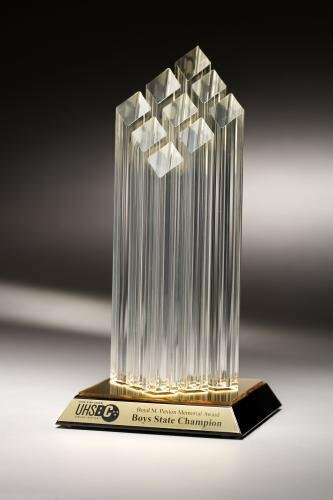 The modern design of this dual triangle acrylic award provides depth and dimension to a very stunning award design. Top Acrylic piece is 1" thick with a 3/4" black acrylic base. Available in two different sizes. Laser engraving to a Frosted white color. Full Color imprinting available on this acrylic award as an option. Stunning 2" thick rich diamond shaped acrylic post with a 1" black acrylic base. Laser engraving to a frosted white color. Available in three different sizes. Image shown with full color imprinting, which is available as an option on this acrylic award. In the example shown, the imprinting was to an all black text on clear acrylic. Boasts at 3/4" thick center back with two 1" Posts accented with gold, silver, blue, green, red or purple accent color. Laser engraving to a frosted white color. Available in three different sizes. Image shown is in full color imprinting, available as an imprinting option on this acrylic award. Clear acrylic award with deep red draped satin pattern and silver mirror border on a black acrylic base with red mirror top. Individually gift boxed.